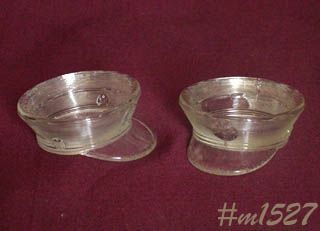 This listing has two clear glass candy containers shaped like military hats! Per reference books, these are circa 1942. They measure 3 3/8" long (at longest), 1 7/16" tall (at tallest), and 3" diameter (at top). Exterior has five horizontal lines and three eagle insignia -- one at center and one on each side. The ledge is halfway down and the eagles face to the right which indicates the containers were made by PLA-TOY CO. of Greensburg, Pennsylvania. Containers are in wonderful but no longer have the cardboard lids/covers. The visor on one hat feel slightly rough -- I'm not certain if it is from the mold or if it's very tiny dings --either way, it's not detrimental. These are very nice collectible items!